Atlas Brass Handcrafted Pepper Mill 7"
Home > Pepper Mills > Atlas Brass Handcrafted Pepper Mill 7"
Atlas Grecian Handcrafted Brass Pepper Mill, 7". Add a note of drama and exotic beauty to your dining table with this splendid 7" brass peppermill. 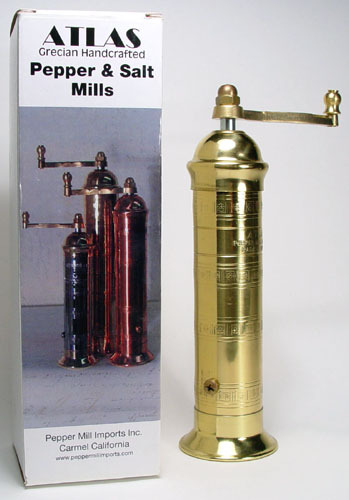 Handmade in Greece, the design of this tall, slender and elegant grinder is from Middle Eastern coffee mills and will bring you compliments from all who step into your kitchen. The grinding mechanism with hand cut burrs in their steel grinding mechanisms are fully adjustable are patented and guaranteed for life.